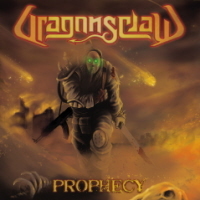 DRAGONSCLAW are an Australian Power Metal band, with “Prophecy” being their debut release. This album has all the catchy riffs, epic high notes and awesome solos that you’d expect from something of the genre. This may be a debut, but the members of the band have already got strong musical backgrounds, with two of them (Lavery and Martens) having played in Ronnie James Dio tribute shows across Australia. So to call the band newcomers wouldn’t be entirely accurate, and anyway, “Prophecy” certainly doesn’t feel like a debut album. The songs are tight, the sound is clear, and it’s just all round well put together. Album opener “Darkness Within” starts with your average Power Metal curl-up-your-toes-and-grab-your-balls scream, and then gallops into a furious riff, with awesome rhythm sections and Lavery’s perfectly suited vocals carrying it along. They cite their influences from bands such as KAMELOT and SYMPHONY X, and it shows (in a good way). Lavery takes his vocal inspiration from greats such as Bruce Dickinson and Rob Halford, and going back to the band’s influences, I could definitely hear a bit of Roy Khan in there too. The musicianship on display here is excellent. The guitar and keyboard solos are consistently awesome, but they don’t take over the entire song. Halfway through the album, something interesting occurs. During “Prophecy Is A Lie”, guess who pops round for a duet? None other than former IRON MAIDEN frontman, Blaze Bayley. It goes just about as well as you’d expect. Blaze goes for a weird Opera type vocal and it’s… strange, to say the least. The only real low point on the album in my opinion, feels completely out of place. It’s a good song otherwise though, with Lavery’s vocals on top form as always, and a guitar solo that is simply stunning. Although saying that, I do have one small criticism. After a while the tracks start to feel a little similar, and almost blend into one another, with no real change in style or tempo. Overall though, this is a brilliant debut album from a group of very talented musicians. If you’re a Power Metal fan, and you’re looking for nothing more than an excellent album of this genre, then DRAGONSCLAW have got you covered.